A light meant for Tommy Trojan instead flooded her. Distraught students gathered in search of answers when experts called the 2016 presidential election. Now Noorhan Maamoon, an international student of Egyptian heritage who was born and raised in Dubai, United Arab Emirates, took her turn addressing the crowd. “In every classroom, I’m the token Muslim, the token person of color,” she said. Maamoon doesn’t get to be an anonymous junior studying journalism at USC. 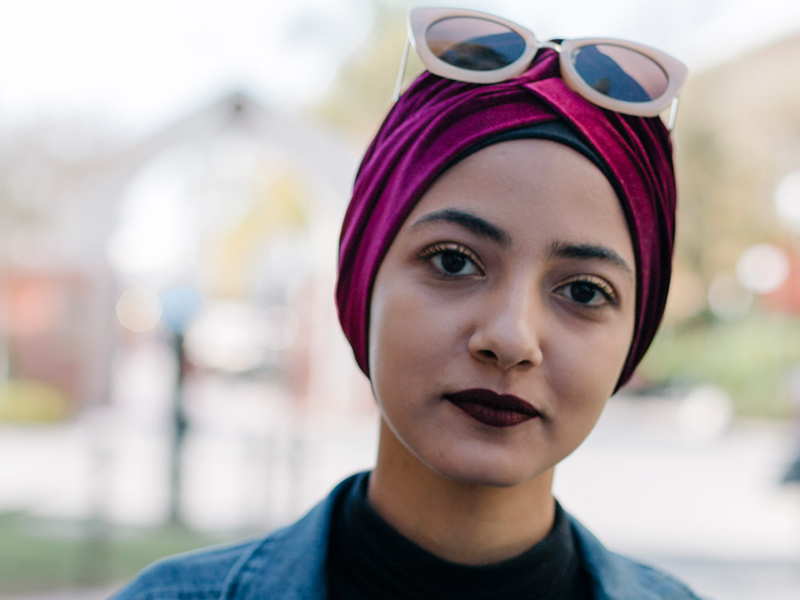 As an Arab Muslim who wears a hijab, she stands out when she’s in line at Trojan Grounds, when she walks through Ronald Tutor Campus Center or shuffles into Leavey Library. Maamoon can sense eyes tracing her steps almost everywhere she goes. But she refuses to be defined by her religion or the cloth crested on her head. Rather than live in fear of sticking out, Maamoon chooses to embrace her visibility. 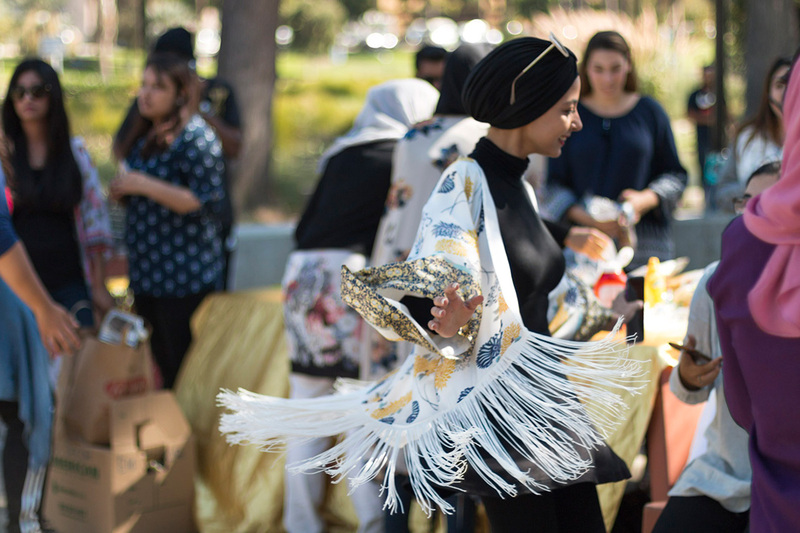 “Everyone notices the hijabi,” she said to the crowd of about 100 gathered at Tommy Trojan. Her focus soon changed from personal to political. Although her future in America suddenly seemed uncertain because of the incoming president’s remarks about Muslims, she chose to voice a different concern. 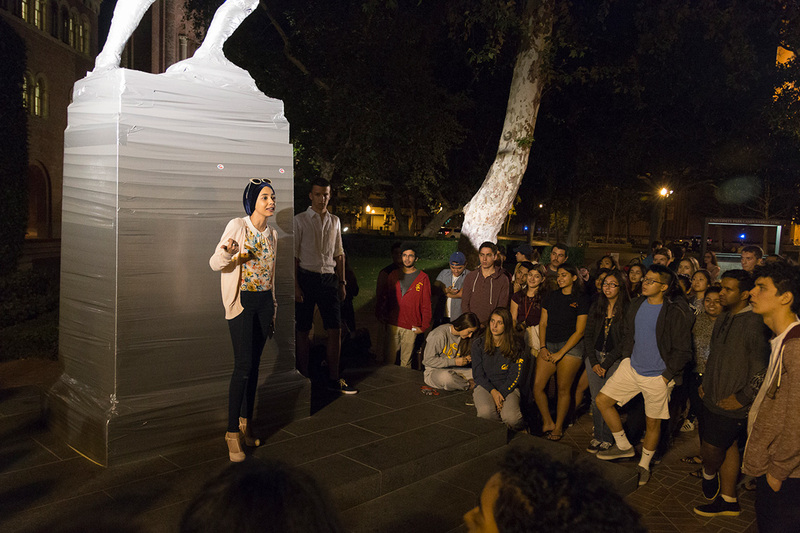 Maamoon wanted to remind the group, whose faces appeared to be blanketed by dejection and fear, that now more than ever, students needed to stay engaged in the political process. Maamoon was comfortable in the spotlight long before she applied on a whim to USC. As a child, she loved to perform on stage. One of her favorite pastimes is singing. At her private British curriculum school in Dubai, she was criticized for her attitude, but she remained comfortable in her own skin. People who know her are quick to acknowledge her poise. “She's unapologetic, she's apathetic to judgement and has a strong sense of self-awareness,” said Muhammad Yusuf Tarr, one of Maamoon’s closest friends at USC. Even so, she faced a culture shock when she moved to Los Angeles, not because of her own beliefs, but because of misconceptions some hold about Muslim women. The notion that she’s oppressed by the hijab, a headscarf she chooses to wear, is pervasive and even shared by some followers of Islam. She’s often singled out to answer questions on behalf of Muslims, who make up 23 percent of the world’s population but just one percent of the United States, according to Pew Research Center. Commonly, those questions revolve around the hijab. Instead, she points to a saying by the Prophet Muhammad, called a hadith, as a source of female empowerment. She gets frustrated by assumptions that feminism and Islam are mutually exclusive, so she fights with one of her most developed tools: her words. As a columnist for the Daily Trojan in Spring 2016, she wrote extensively about feminism, body image and the hijab. In addition to her past roles at Daily Trojan as a writer and editor, she sat on the executive boards of both the Muslim Student Union and Lambda Pi Eta, USC Annenberg’s honor society. Now her involvement centers around the Annenberg Media Center, where she serves as both a deputy news editor and a contributor to the international desk. When she’s not cranking out words on her pink sticker-plastered laptop, she’s probably en route to get more coffee. Along the way, she’s bound to get a compliment for her impeccable outfit of the day. She’s equal parts dreamer, rebel, princess and intellectual. She relishes debate and she’s willing to hear others out when their opinions differ from her own. “She's the most understanding person I know. I've never been afraid to bring up a counter opinion and worry about offending her or causing an overreaction,” Tarr said. Her younger brother and sister, 14-year-old twins, look up to her for the same traits her peers celebrate. “Noorhan has a strong personality, and Shahd and Maamoon see that. They always want to know what Noorhan thinks of this or that, and they love to tell her about their achievements,” said Maamoon’s mother, Iman Fathi. Although she has learned to live with the visibility her hijab affords, she bristles at the thought of being an “empty hijab,” a term she uses to describe Muslim women who aren’t seen for more than their headscarf. She’s more than a compelled ambassador for Islam or a caricature drafted by flimsy political narratives. Among other things, she’s someone who loves music and coffee, whose inquisitive nature sustains her through episodes of disinterest and whose infectious wit fills conversations.